SmarTone has joined forces with Ericsson to conduct Hong Kong's first demonstration of 5G technologies using millimeter wave spectrum. The pair also committed to launch a mobile technology innovation lab later this year, paving the way for the 5G deployment in the city. During the demo, which took place Wednesday at Ericsson’s office in Hong Kong, the companies achieved a data throughput of 5.7Gbps over a 5G prototype through the use of 4x4 MIMO antenna technology in the 15-GHz band. The prototype, built by Ericsson, comprises a 5G base station, next-generation antenna and a test mobile station. 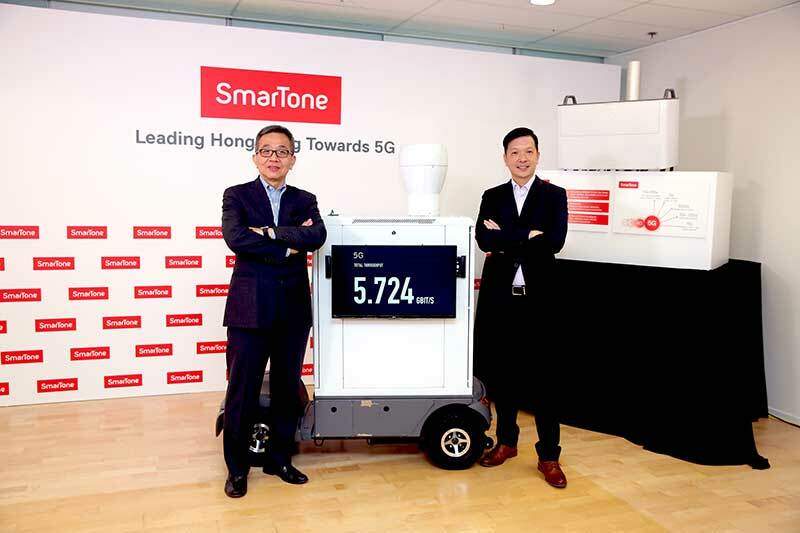 SmarTone chief technology officer Stephen Chau said the operator will later upgrade the 5G prototype to support 8x8 MIMO antenna technology, which will double the transmission speed to over 10 Gbps. Michael Lee, CTO for Hong Kong and Macau at Ericsson, said the demo uses 400Mz of spectrum and OFCA has allocated a total of 612MHz of spectrum for all mobile operators in the city. SmarTone and Ericsson also demonstrated use cases for potential 5G applications, including a so-called “Human-IoT Interaction arm”, which allow humans to control a robotic arm remotely in real-time with 5G capabilities of low latency and high-bandwidth. Such applications, Chau said, could allow surgeons to conduct operations remotely using robots or be used in road accidents, operations/activities in scenarios unsafe for human presence. In another proof-of concept demo, a robot was connected to the cloud via a simulated 5G network, using real-time analytics to balance the robot with the latency set at 10ms. In future this application could be used for mission-critical apps, AI and intelligent automation like self-driving cars or real-time traffic systems. While commercial 5G services won’t be ready until 2020 and standards are still to be ratified, the advent of 5G will open up a lot of opportunities for operators and allow for range of different applications, such as AI, VR/AR and the IoT-enabled world of real-time applications and services. The demo just offer a glimpse of 5G capabilities that will enable users to download a 4K movie in mere seconds or sit behind the wheel of a driverless car, Chau said. The executive said SmarTone’s innovation lab with Ericsson, which is expected to be ready in the middle of year, is aimed to facilitate cross-industry collaboration and develop potential 4.5G/5G use cases and vertical applications. The innovation hub will provide a platform for mobile, IoT and cloud, Chau said. “5G will herald a significant shift towards the hyper-connected and real-time world of IoT. Our innovation hub will see SmarTone and Ericsson forge collaboration with other industry and technology leaders to usher in a new era of mobile possibilities for consumers and businesses,” he noted. As part of its ongoing investment in 4.5G, SmarTone plans to roll out Licensed Assisted Access (LAA) network later this year, which will leverage existing licensed and unlicensed spectrum to enhance the operator’s LTE network to deliver up peak speeds up to 800Mbps. The company also plans to introduce a narrow-band IoT (NB-IoT) network with enhanced coverage later this year. Last week SmarTone forged a partnership with Cisco Jasper to launch IoT services in the city, in its latest attempts to tap the burgeoning IoT market. Last November SmarTone contracted Ericsson as its sole supplier for core and RAN equipment in a five year deal which aimed at paving the way for 5G deployment.